The growing necessity to gain real-time insights into the sale prospects and to streamline the entire sales process is driving the demand for sales force automation category across the end-user sectors like BFSI, consumer goods and retail, IT and telecom, pharmaceutical, and FMCG. The extensive adoption of cloud-based sales force automation solutions in addition to the integration of social media platforms into the sales force automation solutions is driving the category spend momentum to a significant extent. However, buyers might be challenged with excess procurement spend because of the increasing training costs borne by service providers owing to the frequent software upgrades of the automation solutions. Request a Free Sample of this sales force automation market intelligence report here! Automating sales processes are benefitting buyers in the US with sales data and information about leads from anywhere and from any device while also reducing the requirement for cold calls. Such category benefits are expected to drive the spend momentum in the US. The category value in APAC is expected to touch a figure of USD2.52 bn by 2023. This growth is chiefly credited to the necessity of automating the sales process in the region. Availability of service providers that can offer industry-specific and customized solutions is favoring a large-scale category adoption in North America as the region had claimed about 32.01% of the category revenue last year. Insights offered in this sales force automation procurement research report include supply market forecasts, major cost drivers, and category management insights. Such insights are relevant for both the buyers and the suppliers who seek a risk-free and a cost-effective procurement strategy. The category spend segmentation done in this sales force automation market intelligence report will guide the investors in identifying the best investment areas as well as help them in identifying cost-saving opportunities in the market. Get free customization of this sales force automation market intelligence report to get information tailored to your every requirement. "Before procuring the sales force automation tool, buyers must conduct a pilot test to assess the tool's functionalities that are core to the internal operations of the sales team," says SpendEdge procurement expert Tridib Bora. Purchase the full sales force automation market intelligence report here! 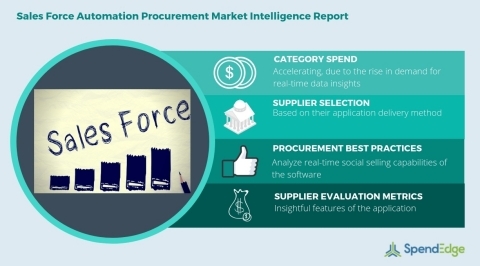 SpendEdge's procurement market intelligence reports for the information technology category provide detailed supply market forecasts and cost drivers that impact category growth. Such information will help procurement managers as well as the suppliers to determine the total cost of ownership and change their procurement strategies accordingly. Additionally, SpendEdge's reports provide category management insights and information on the procurement best practices for the category.